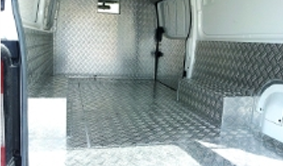 Panel vans can be converted into refrigerated vehicles for chiller or freezer temperatures. Side walls & Roof : 50mm/100mm Thick PU Injected Sandwich Panels with Prepainted Galvanized Steel for chiller and freezer van conversions respectively. Flooring : 100mm Thick Floor panels reinforced with Marine plywood with Aluminum Chequred plate or GRP Floor top. 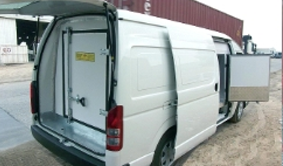 Doors : Additional Side & Rear Doors will be provided for freezer van Conversions. Cooling Unit : As per customer requirement. Extras : Optional partition inside the compartment. Side Walls : Aluminum Chequered plate cladding covering all internal sides. Floors : Marine Plywood base with Aluminum Chequred Plate or GRP Floor top.